In the last five years, Kellie Pulce has run ten marathons. In 2010, she clocked in four marathons, total. LA, Orange County. San Francisco, Long Beach, Ojai to the Ocean, and Big Sur. She’s run them all. She averages about a four-hour trek. This weekend, she’s running the LA marathon. She also practices yoga, and was recently in Annie Carpenter’s Restorative Teacher Training “Sukha” class. Restoratives restore you. Sounds sweet, huh? That’s what Sukha means. Sweet. Ease. Joyful. But don’t be fooled. Restoratives can also be terribly hard. Because if you’re anything like Kellie - a runner, a go-getter, a do-er - slowly down the physical practice brings up a lot of stuff…it can even feel downright confrontational. Kellie shared how running and Suhka weave together in her Practice. What fuels me the most about running marathons is the sense of mental freedom and physical accomplishment. Running long distance is very meditative. It really is a test of mind and body working as one. My training regime has been open to anything new. I've tried Chi Running and Minimalist Running to improve my form. In 2010, I introduced yoga into my training. Yoga, I believe, is why I was able to run four marathons that year. For the last six months, leading up to the LA marathon, my training regime has varied in intensity. I'm doing more yoga than running – which is a switch. The Sukha immersion was really intense, emotionally and physically. During the immersion, I was physically unable to run that week because I was so exhausted. Yoga is a big part of my cross training and usually my physical practice will be just as intense as my runs. I thought I had been taking it easy this training cycle but I was being foolish. In Sukha, I learned the true meaning of ease, softness, and forgiveness of self. Two days after the immersion ended, I went on my final long run and it was the best run I've had in a long time. Kellie is in Vrksasana - tree pose. 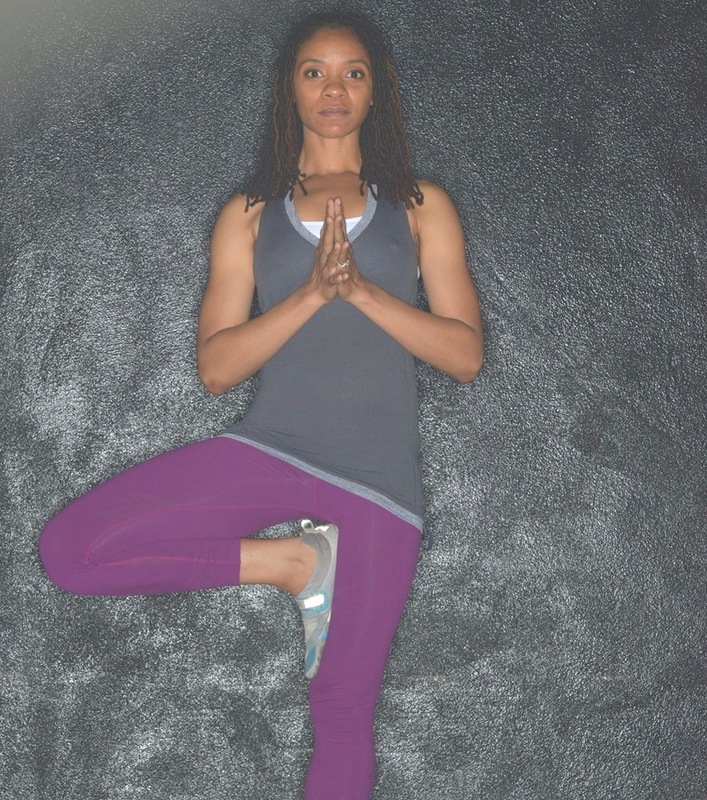 This balancing pose requires a steady gaze and a strong sense of your core. Root the sole of your standing foot into the floor. Seal your lifted foot into your thigh and your thigh into your foot. Feel the uplift through the centerline of your body as you balance, maybe swaying even a bit, like a tree in the gentle wind.